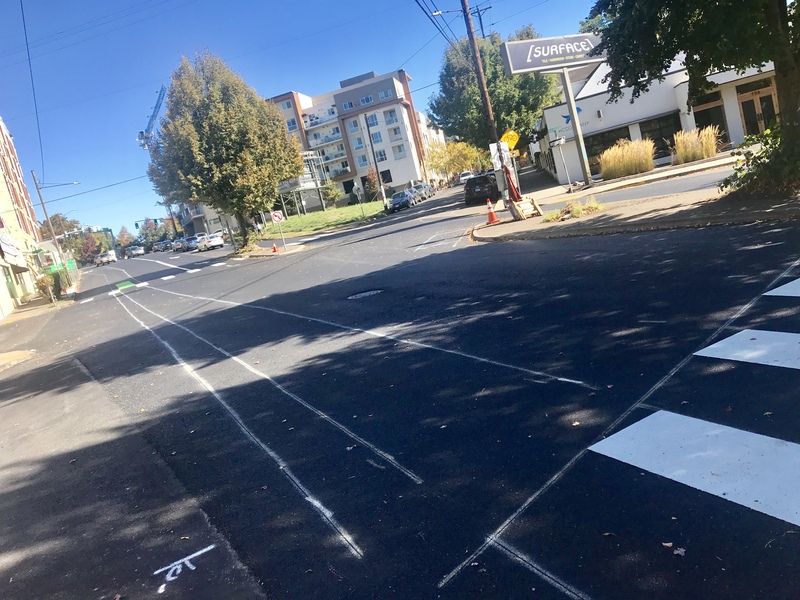 The striping work at Sandy and Ankeny has already begun. See the official project drawings below. 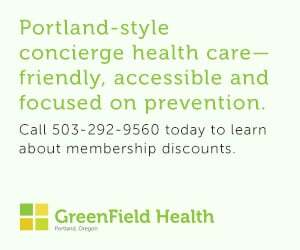 The Portland Bureau of Transportation is making updates to SE Sandy Blvd between Burnside and Alder. 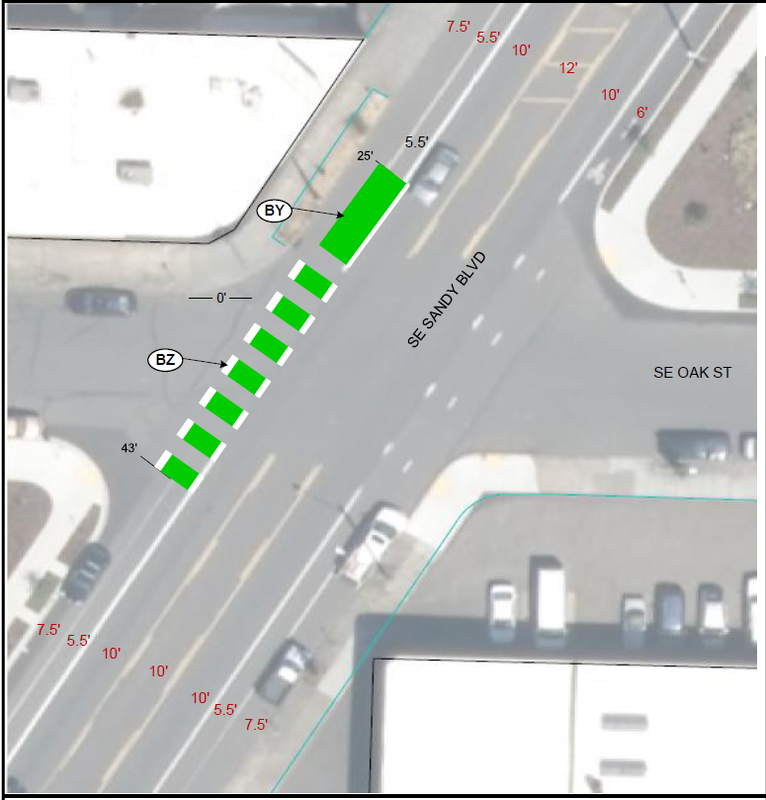 Sandy is being repaved, so the city is grabbing the opportunity to tweak the striping and add other features they hope will make the street safer. 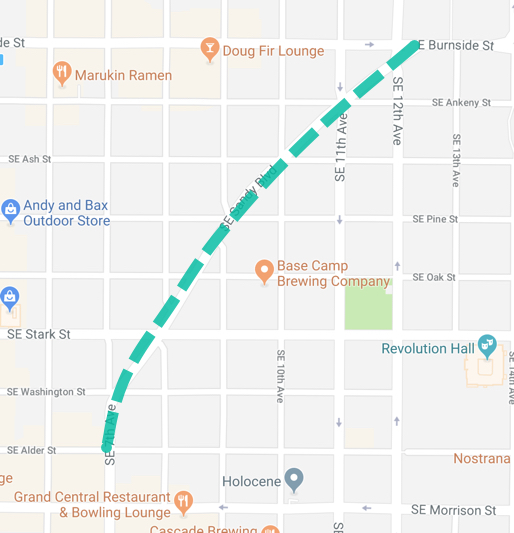 This half-mile section of Sandy is a key connection between the Lloyd (via 12th Avenue) and the central eastside (where it turns into 7th Avenue). 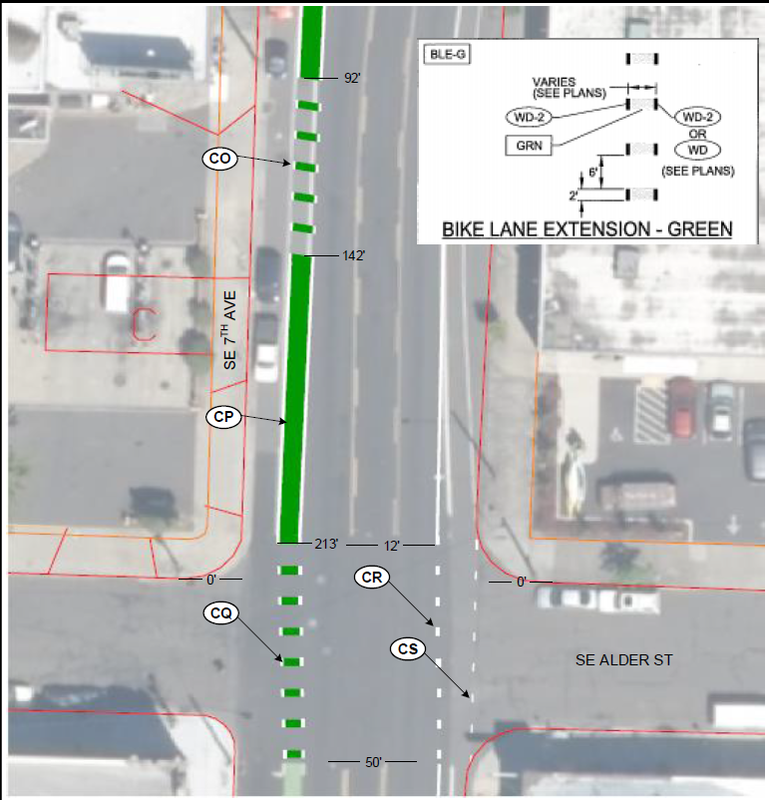 However, despite its value in our network, this section of Sandy is currently striped as a standard, unprotected bike lane. We need better facilities here because it’s on a hill (down going south, up going north) and because there are several tricky crossings. 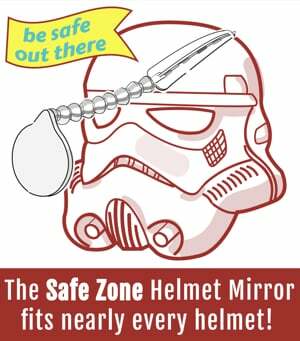 In particular, the crossing of the Ankeny neighborhood greenway has been a stressful spot for years. The large intersection of SE Washington and 7th is also a sketchy spot that isolates bicycle riders in a wide expanse of pavement with threats from all directions. 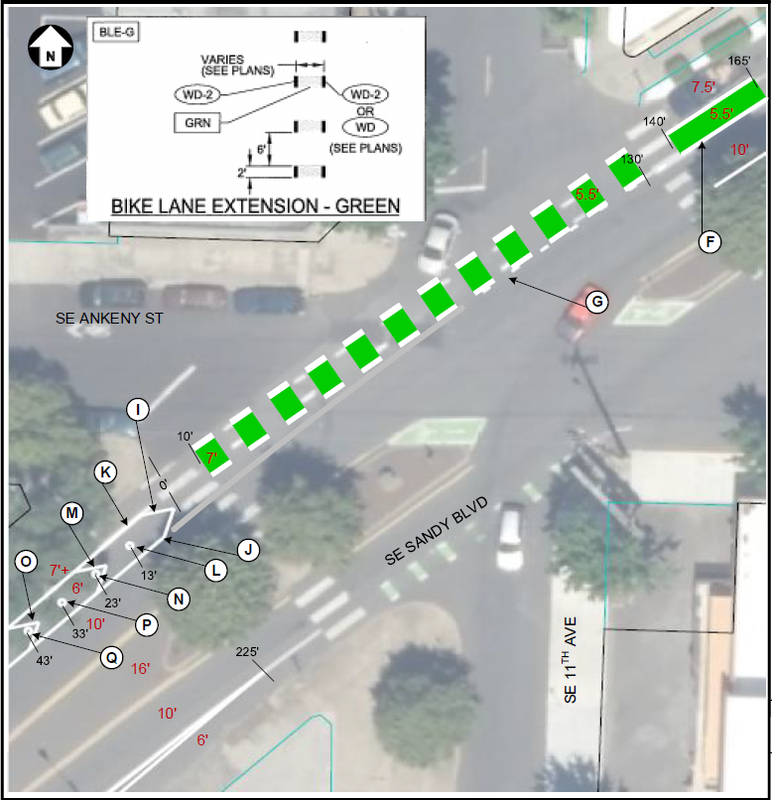 PBOT’s fixes will include a lot more green coloring to add conspicuity to the bikeway, more buffers to increase the separation between modes, and plastic delineator wands that will act as low-budget median islands and effectively reduce the width of some of the intersections (second to last image below). 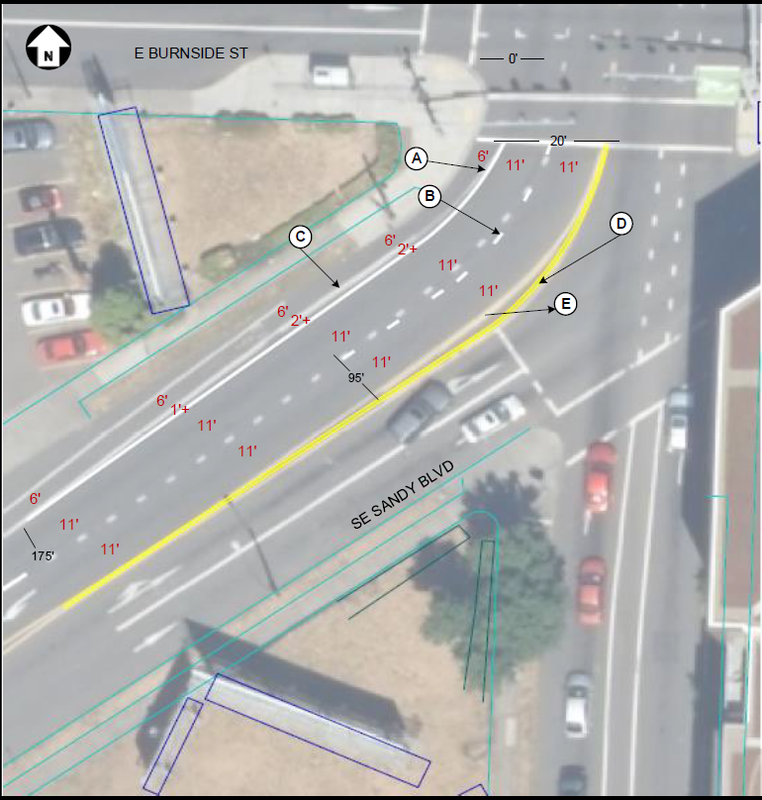 In addition, to improve the notorious Ankeny crossing, PBOT says they plan to pull back auto parking, “to daylight the pedestrian crossing.” A new bike corral is also slated to be installed. 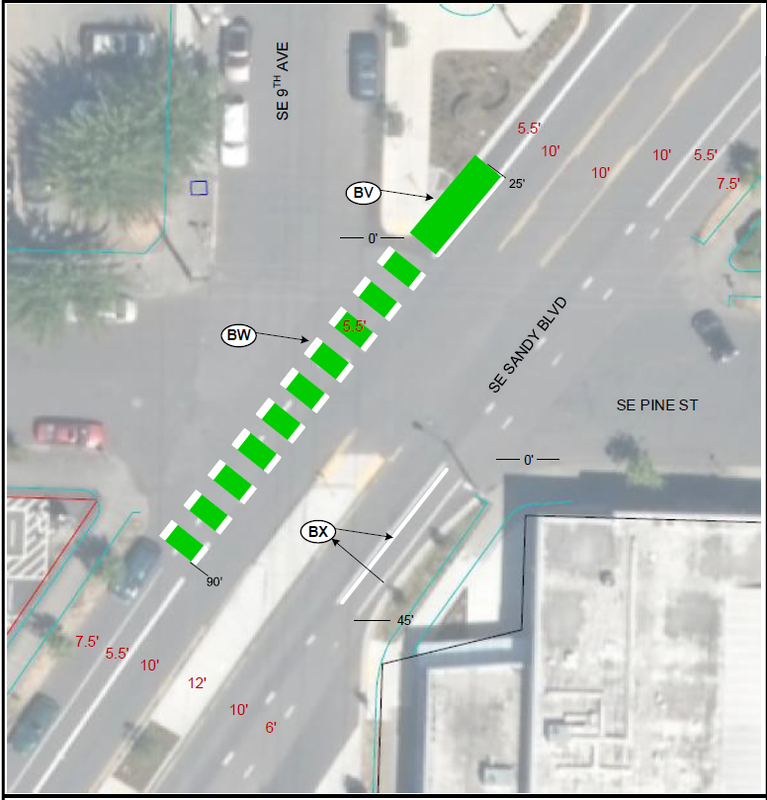 The new striping will connect in the southbound direction to the existing green-colored bike lane on 7th Ave as it approaches Morrison. 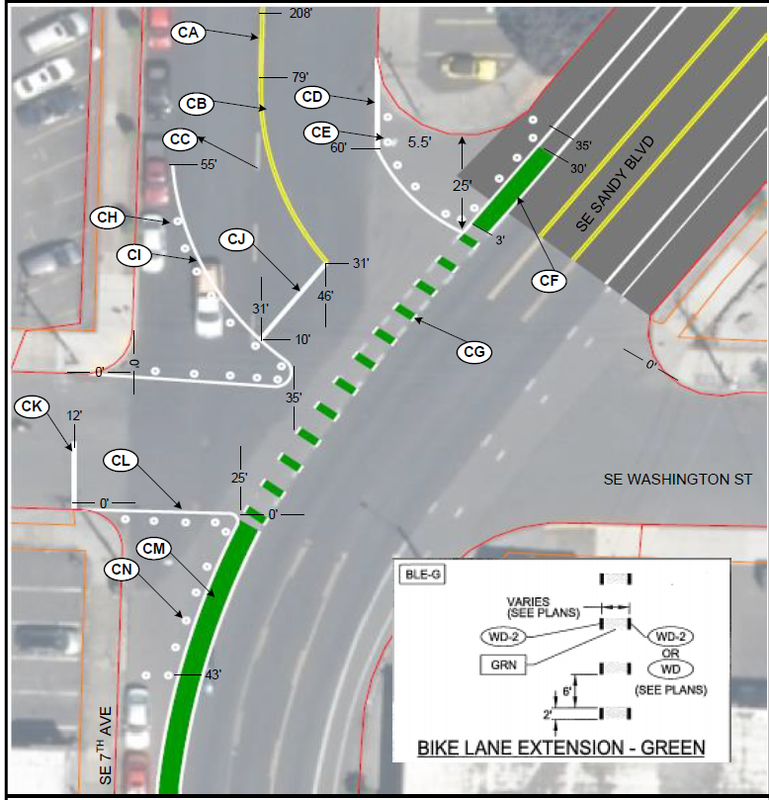 Note how PBOT will use striping and plastic delineator wants at corners to narrow the intersection. 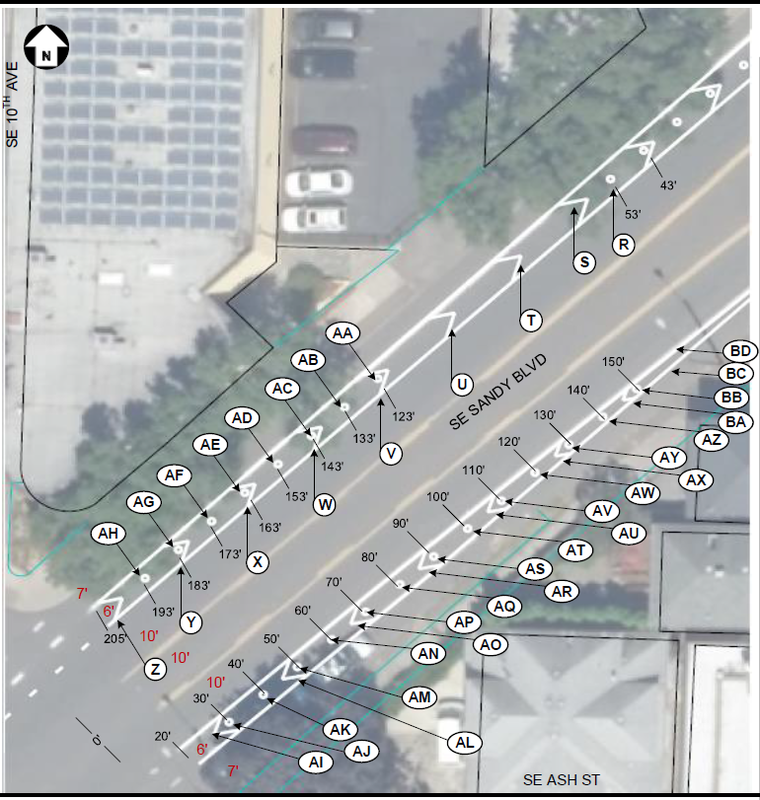 This project will also include a new signal at the tricky Ankeny/11th/Sandy intersection. 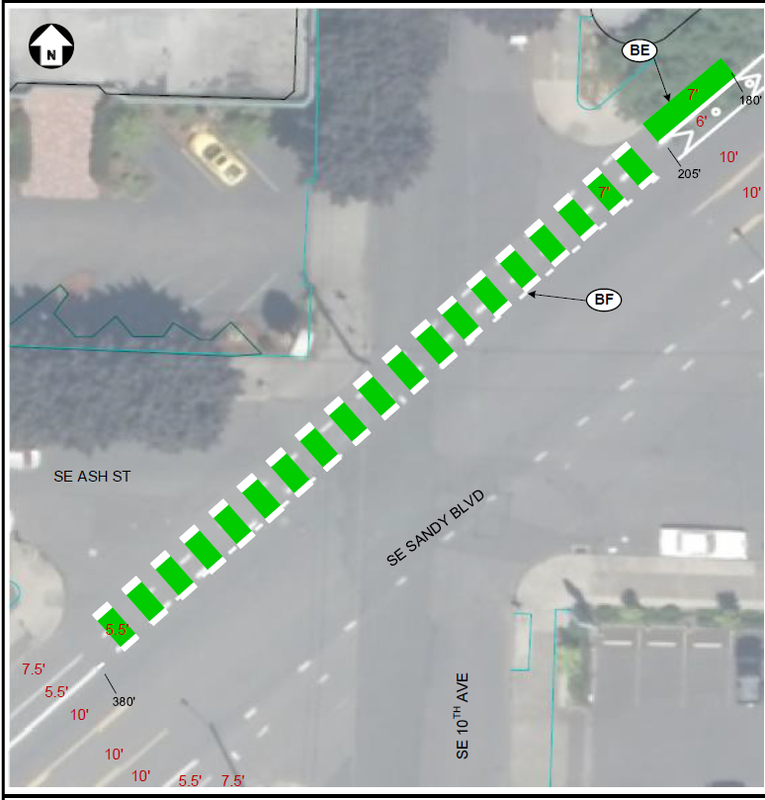 Funding for the signal comes from PBOT’s federally-funded Central Eastside Access and Circulation Enhancement Project which we covered back in February 2017. 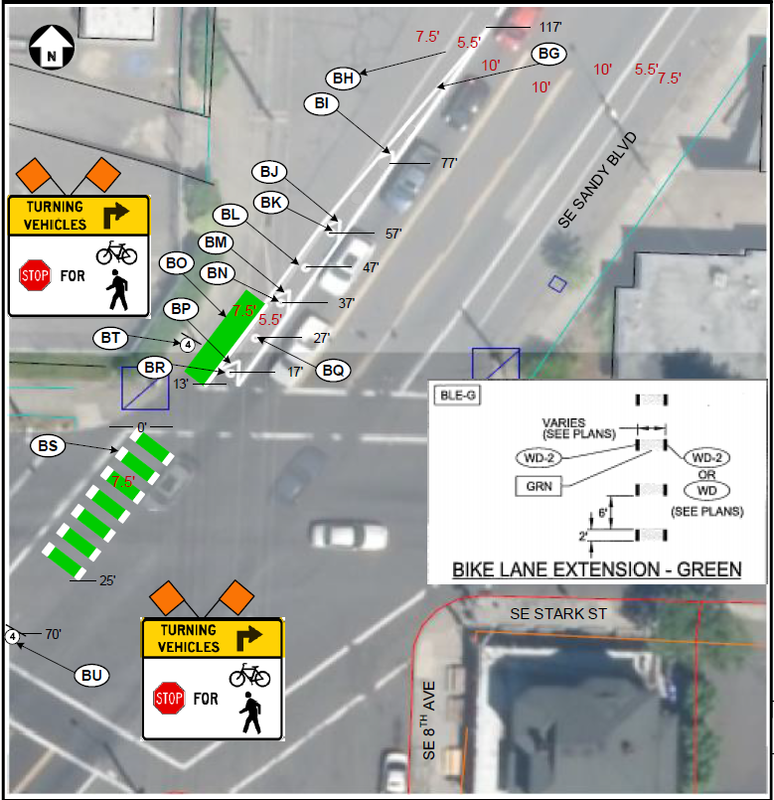 The post City aims to tame Sandy Blvd through central eastside with bikeway, safety updates appeared first on BikePortland.org.